Every other year, Chicago temporarily becomes the puppet capital of the world, with the Chicago International Puppet Theater Festival bringing in puppet artists from around the world to perform shows across the city for both kids and adults. This year marks the third edition of the biennial festival, and puppet and theater artists are here from Japan, France, Chile, Israel – and Chicago. 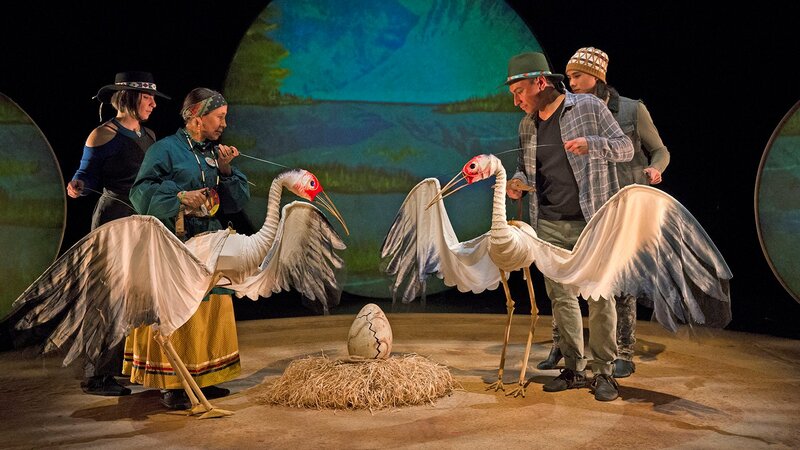 Tonight, we visit with Heather Henson, from the famous family of puppeteers, and Ty Defoe, who are co-directors of the festival's opening show, “Ajijaak on Turtle Island." For more information about the show and the Chicago International Puppet Theater Festival, visit the festival's website. Below, a transcript from our interview with Blair Thomas, festival founder and artistic director. Chicago Tonight: So how does this ancient art form still thrive in the 21st Century? Blair Thomas: We’re in a renaissance of puppetry now in the past 30 years. The form has really taken off in many ways. Artists are taking traditional techniques, and they’re using them with new ideas. Puppetry is a place for the irrational to still thrive and live. It has this uncanny feeling, because you recognize something that looks like what a human looks like, or what an animal would do, and you know that it’s not alive, but it looks alive. And it’s that back-and-forth that’s so compelling – it’s very clear to you that it’s a puppet and it’s being performed in front of you, but at the same time there’s a magic that it embodies. And in our world today, where we’re saturated with so much media, to go into a theater and be in the presence of this magic is something that’s extraordinary. Chicago Tonight: What can people expect to see in the performances – and where can they see them? Blair Thomas: We have some traditional puppetry like marionettes and some traditional Japanese puppetry that’s similar to Bunraku, and then we have a lot of work that uses a variety of styles of puppetry, from spectacle puppetry – large-scale puppets that maybe you’d see in a street parade – to shadow puppets and hand puppets and costume puppets. We’re up at the Neo-Futurarium [in Andersonville] and down in the Beverly Arts Center and the Logan Center for the Arts in Hyde Park. Also, the Art Institute, the Studebaker Theater in the Fine Arts Building, Links Hall, Chicago Shakespeare, the Museum of Contemporary Art – many different venues. Chicago Tonight: What shows are you excited to see? Blair Thomas: Our opening show, “Ajijaak on Turtle Island,” is by Ty Defoe, who’s an indigenous artist, a Native American, who uses traditional performance practices in collaboration with IBEX Puppetry, which is Heather Henson’s company. Heather is the youngest daughter of Jim Henson, and this aesthetic of her puppets and Ty’s work is really a beautiful spectacle. Also, we have returning Plexus Polaire, the Norwegian-French company doing a piece called “Chambre Noire” [about Andy Warhol’s would-be assassin] at the Dance Center at Columbia College, as well as Silencio Blanco from Chile, who have a piece called “Pescador” [a series of portraits of people at sea] performing at the Instituto Cervantes. Chicago Tonight: What are your other creative plans for the new year? Blair Thomas: I’m working on a piece called “Buried Alive with Edgar Allen Poe,” and it uses Poe’s life and stories to create a piece about a man who finds himself dead. I’ve also started the Chicago puppet studio [part of Blair Thomas & Company], and we’re designing puppets for other companies. We just finished “The Steadfast Tin Soldier” at Lookingglass Theater, and our next project is “Pinocchio” with The House Theatre [premieres March 28].